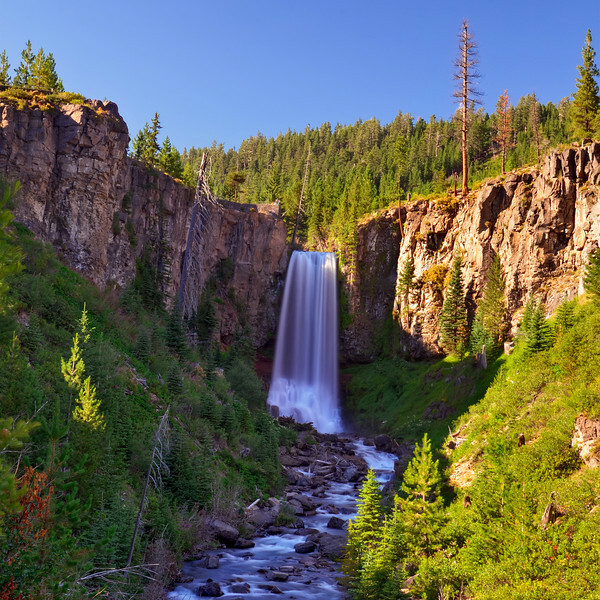 Back in the day this shot would have been impossible of Tumalo Falls near Bend, OR. An abandoned campfire in 1979 led to a wildfire that just leveled the old growth spruce and pine that previously was found here. By the way that's one tall waterfall, for scale check out the observation platform and tiny insect-like people just to the left at the top of the falls. There's some debate on the height which I find hilarious in this day an age, it's oft-cited at 97 ft, but some claim 131 ft ( http://www.waterfallswest.com/waterfall.php?id=111 ) . Notes: Used a 2-stop ND filter joined to a Moose Polarizer to get as long of an exposure as possible. Also I went when I knew the falls would be mostly in shade in order to help keep the exposure longer. This image is a blend of an HDR image via the image compressor in Photomatix and that result was blended down on the middle EV frame. The HDR was made from 5 exposures 1EV apart.